These days it seems like Time just flies by. Pre-baby, I thought nothing of time. One hour didn’t seem like 5 minutes. I had free time. It didn’t take 4 hours to watch a two-hour movie because your toddler was screaming through half of it and you had to either pause it, or back it up to catch what you missed. Two and a half hours of nap time only really feels like a half hour and I always seem to end my day looking around at all the things I didn’t get done. My weekends seem to just fly by and it’s just so weird how even though I don’t have to make that 9am staff meeting every monday morning, I still feel crunched for time and its all from “mommyhood”. Time just isn’t the same. Its fast. For example I look back on the last year and just can’t believe how much J has grown and I can’t believe he’s saying new words every day and it just seems to be happening so so fast for me. We are in the holiday season and it feels like we just had Christmas a few months ago and J was playing with his new toys. …and man in two weeks its Halloween! Wow! 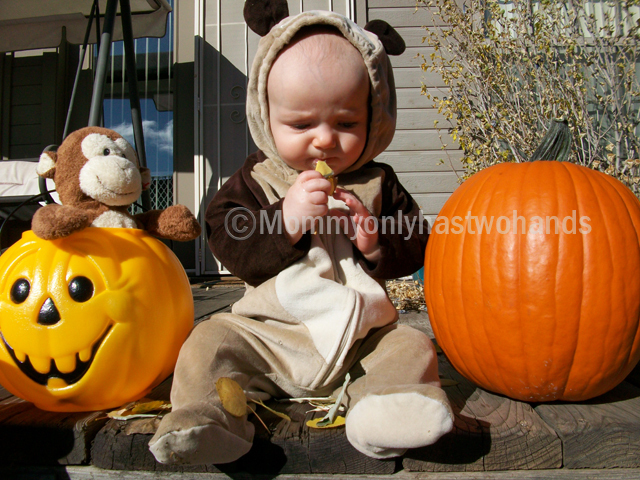 Last year J was a monkey for Halloween and a cute one too! Today we decided to get J a Halloween costume because we really couldn’t put him in an outfit his grandma gave him that just went down to his knees and had an alligator’s snout that poked out from an area on my toddler that it just shouldn’t poke out from. It would have given him a manhood well beyond his years…and I really didn’t want him being laughed at if we took him out in it. It was a poorly designed costume. I couldn’t find a picture of it on the internet anywhere but just imagine a cute little baby alligator costume, but with a snout pointing out of the groin area of the costume. Yeah….um…no. Hey Hey For the Mondays! that is a cute pic and love the monky in the pumpkin:) I thought about a devil costume for my 1yr, cause he always into something. Hi Heather. It has been a little while since I have been able to stop by. I just wanted to catch up and say Hey!. The devil outfit is just too cute. It would be just as fun for mommy and daddy to dress up as well. I can’t believe it is Halloween already. Time does fly by way too fast! I agree time goes by faster with children. My theory is that time really doesn’t go by faster but that we have a physical, changing being as a constant reminder of the the passage of time. Regardless, I try to savour every day. Your son is so cute! Thanks for sharing! LOL at the alligators snout. Grandmas, ya gotta love ’em. Your son is adorable and I hear you; time certainly does fly! I have an almost 4 year old and an 8 month old. Time is so precious!